How do you cure the post holiday blues? By escaping to an idyllic corner of the Isle of Harris, that’s how. I recently returned from Iceland feeling that ‘meh’ way you get when a much-anticipated holiday ends. My unseasonably late summer holiday had flown by, leaving me longing for Iceland’s dramatic landscape, quirky architecture, and endlessly appearing rainbows that had me grabbing for my camera like a woman possessed. No sooner had we arrived home to the mother of all welcomes from The Wee White Dug, than we’d unpacked, repacked and set off on a Scottish road-trip. We were Harris bound, for a self-catering break with Cottages and Castles. After an overnight stay on Skye we hopped on the morning ferry to the Isle of Harris. I was craving foreign shores and unfamiliar places, and wasn’t really ‘feeling it’ for Scotland at that moment in time. The feeling didn’t last. Spotting a rainbow from the ferry window, I was reminded that Scotland could do mighty fine rainbows too. Then, up ahead I caught sight of the rugged landscape of Harris and it felt like I’d been reunited with an old friend. I couldn’t wait to embark on a new adventure in the Outer Hebrides with Mr G and The Wee White Dug. I first visited Harris in the spring of 2015. The place that drew me to the island then was the first place we headed on our return – Luskentyre Beach. The boy seemed delighted to be back and charged around after his favourite beach toy. Once he’d puffed himself out running, we enjoyed a game of tug-o-war. It was a hard-fought battle but (as ever) he won. Then, to drive home the point that ‘there’s no place like home’, we were treated to another rainbow. Who needs foreign holidays? With Mr G displaying signs of hanger we made our way to the Isle of Harris Distillery in Tarbert for lunch. Since opening in September 2015, Isle of Harris Gin has won many accolades and awards – and rightly so. My friend, fellow blogger and Harris expert Graeme had suggested we visit. 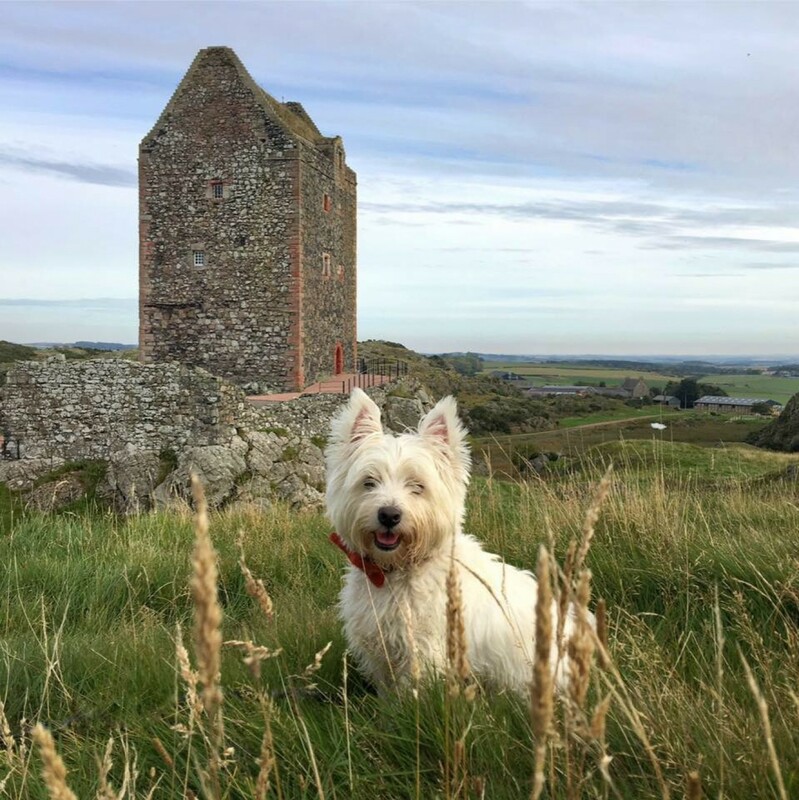 He’d recently been with his Westie grandson and confirmed that the food was good, and distillery staff were happy to serve lunch in the reception area to visitors with four-legged family members in tow. The boy toasted himself by the fire, while Mr G and I tucked into lunch. Tasty homemade soup (sweet potato & coconut for Mr G, and tattie & leek for me) was followed by pate with oatcakes (double smoked salmon for Mr G, and chicken liver for me). A new lunch venue was added to our long list of favourites. Before heading to our accommodation we stocked up on essentials for our island escape. One bottle of Isle of Harris Gin, and two plump grapefruits purchased from the distillery shop and we were good to go. Knowing we couldn’t survive on gin alone, we also stopped at Tarbert’s general store for food. Car laden with goodies, we twisted and turned our way along ten scenic miles towards our island but n’ ben at Manish. After a short stop to watch seals we arrived at our destination. Wow – what a location. Taigh Ailein sat at the water’s edge on a small peninsula connected to Harris by a narrow strip of land. We charged around the front garden like headless chickens, in awe of the incredible location. Taigh Ailein was a dream house. Inside, it had been tastefully refurbished to a high standard. Downstairs, there was a WC and a large kitchen with all mod cons, and dining table with a view. The downstairs lounge (also with a view) had a huge comfy sofa and log burning fire. Books, games and DVDs were provided for cosy nights in. Upstairs, was a family bathroom with shower cubicle, and three bedrooms (a single, double and triple). We chose the double with brass bedstead and pretty duvet set. It was a good choice, as we slept like logs throughout our stay. Unpacked, we drove to Rodel nearby. We planned to go for a short hike, and indulge my passion for medieval grave slabs carved with warriors. The last time we visited Rodel, St Clement’s Church was scaffolding clad. Restoration work complete, it was nice to see it without scaffolding. Inside, I made a beeline for an old friend – Alasdair MacLeod, 8th Chief of the MacLeods. He commissioned St Clement’s Church, and also the ornate tomb he was buried in there some time between 1545 and 1547. In life, a sword injury earned him the nickname Alasdair Crotach or ‘Humpback’ – although it’s not clear if that was to his face, or behind his misshapen back! A 2km jaunt around Loch Horsagearraidh had been our mini-hike of choice, but thirty or so squelchy steps in we bailed on our Achilles Heel (a boggy ramble) and headed back to Taigh Ailein for the evening. I rustled us up a rather tasty chilli con carne (even if I do say so myself), and we spent the night chatting, drinking island gin and gazing outside at the view. We watched delighted as the sun set, casting a rosy glow on sea and sky. The boy got in on the action too, nosing out of the window transfixed. Day two on Harris dawned, and we breakfasted on porridge and jam slathered toast, before heading back to Luskentyre so the boy could cut loose on the sand. Beach fun over, it was time to cross the bridge to Scalpay for a hike. En route we stopped at a couple of abandoned crofter’s cottages. On my last visit to Harris I photographed several but didn’t look inside. This time I peeped inside a couple. Dilapidated and dangerous, there was a sad beauty to them. Tattered wallpaper and tiled fireplaces hinted that someone had loved these homes. Did families once gather in the now derelict rooms, laughing and chatting over dinner? If only walls could speak. We began our hike at the Eilean Glas Lighthouse car park, setting off along the Old Peat Road. I love the smell of peat (there’s nothing like a peat burning fire). The peaty flavour of Islay whisky is also delightful. Walking on peat though is another thing entirely. I HATE boggy walks. Luckily, this walk followed a rocky path which snaked its way through the wet, peaty landscape towards the coast. It was a perfect blue sky day with a nip in the air. Blooming heather, added a pretty pop of purple to the russet coloured landscape. We Passed peat stacks, dried and ready to fuel winter fires, and numerous peat cutting trenches. No prizes for guessing how this path got its name. As we approached the lighthouse the path petered out, and some creative bog hopping was required to reach the candy striped tower without brown, boggy feet. Eilean Glas is one of the many lighthouses in Scotland designed by the Stevenson family. Built in 1824, it was designed by Robert Stevenson (grandfather of Robert Louis Stevenson). As a lover of the works of RLS I’m glad he bucked a family trend for a literary career. After enjoying the remote tranquility of the spot, we turned to head back to the car. The entire walk was completed with a spring in our step, as much to our delight, the peaty landscape beneath the path made it bouncy. At 4.2 kilometres it was a short, scenic and satisfying hike. After a take-away lunch in Tarbert it was time to hit the beach again. Harris has more stunning beaches than you can shake a stick at. One of the most iconic is Seilebost. It’s incredibly beautiful, and impossible to pass without stopping to admire. A little further south is Horgabost, the beach there is smaller than Seilebost but no less stunning. Horgabost has a wild and remote quality. It’s one of my (many) favourites in Scotland. The boy seems to have no preference when it comes to beaches – he loves them all. After visiting Horgabost we stopped at Borve. With low grassy dunes backing the beach, it’s the perfect place to capture those “look at how much fun I’m having” action shots. Ever competitive Mr G is always happy to oblige with some beach leaping – pushing himself to jump higher and higher with each new attempt. Tired after a long day out, we called time on our beach shenanigans to head back to Taigh Ailein for another night of food, drink and view gazing. Porridge and jammy toast eaten, the island of Great Bernera was our first stop on day three of our Hebridean adventure. Great Bernera is a lovely little island that lies just off the west coast of Lewis. It’s reached by bridge, making it easy to visit. Once over the bridge we drove to Bosta – site of a historic village, stunning beach and unusual bell. Semi-subterranean, drystone houses dating to the Iron Age were discovered at Bosta Beach in 1993 after a huge storm unearthed the foundations of a village. The site was excavated in 1996 and a treasure trove of finds were unearthed. Sadly, once excavated the fragile structures couldn’t remain exposed to the elements so they were reburied. A replica house stands near the ancient village, so visitors can discover how the Pictish occupants lived. Bosta may be an archaeologists dream, but it’s also a lovely spot with a gorgeous beach. Near the water’s edge we spotted one of the UK’s five Time and Tide Bells rising from the sea. The bells, which ring at high tide are permanent art installations by Marcus Vergette. Each is inscribed with words chosen by the local community. Before leaving Great Bernera we visited Callanish VIII by the bridge. The Neolithic standing stones are positioned in an unusual semi-circle formation. With numerous sequels, the Callanish stones are the Star Wars of these parts. Back on Lewis, we snapped the boy beside giant chess pieces, then stopped for lunch at the Uig Community Centre’s excellent cafe. Our Neolithic stone fest (part II) began at the boggy Callanish III site. As he posed for photos like a pro, the boy was watched by curious sheep. From Callanish III we followed a boggy path to Callanish II. There are few things that’ll lure me over boggy ground, but I’ll always risk soggy feet for stones. We finished stone stalking at the awe-inspiring Callanish I site. These magical 5,000 year old stones are my favourite in Scotland. Up there with Neolithic monoliths in my ‘old stuff I love’ top five come brochs. The roundhouse dwellings built between 2,300 and 1,900 years ago are a remarkable feat of engineering. Dun Carloway on Lewis is one of Scotland’s best preserved brochs. It’s thought to date to around 200 BC, and may have been used for 1,200 years. It’s incredible to think a building could be in use for so long. I can’t imagine the creaky 1960s staircase in my house still going strong 2,000+ years from now! Our history fest ended at Gearrannan Blackhouse Village, north of Dun Carloway Broch. The restored, traditional blackhouse village houses a heritage museum, shop and hostel. The heritage museum, which is housed in two of the cottages gives a fascinating insight into life in the village. I love the recreation of a 1950s interior, complete with welcome mat by the fire. The best part of visiting though, is watching a weaver make Harris Tweed on a traditional loom. The boy seemed more interested in licking peat crumbs off the floor, than discovering the origin of his natty bow ties. Mr G and I were better scholars and learned that a Harris Tweed weaver can make an incredible 20 metres of cloth a day. Stornoway was our final stop before heading back to Taigh Ailein. Stornoway White Pudding suppers and strawberry milkshakes for dinner provided a satifying sugar and stodge hit after a long day spent exploring Great Bernera and Lewis. And just like that, our trip was over. It’d been a blissful break, spent in a fabulous house by the sea. I arrived on the Isle of Harris longing for Iceland. I left – reluctantly. Thanks to Jemima at Cottages and Castles for arranging our trip, and also to Lizzie for hosting us in her beautiful holiday cottage. Although our accommodation was provided on a complimentary basis all opinions are my own. What a trip! I do love the Outer Hebs, in any weather it looks bonnie but you certainly had the best weather. WWD melts my heart in all these photos, striking a pose. So cute. Your photos are just stunning; the light is perfect. Enjoying the islands through your blog in hopes of returning again and again. Lovely photos and a darling wee dog. I hope to return to Scotland one day there is just so much to see. It’s less than 2 weeks since I left Scotland and your posts still have the ability to make me homesick despite my recent ‘fix’. I’m also jealous of the weather as I didn’t get a lot of blue sky whilst I was over. The Outer Hebrides is such a special part of the country. I follow you on IG, loving your images. Reading your blog has inspired me even more to go to Scotland! Another amazing blog, Sam! Loved the stones, and beautifully detailed carvings, and Casper’s happy face! Love this post! We cannot wait to go back to Lewis & Harris with Elsa, there is so much more that we need to explore! Great post and super photos. Really must visit soon.